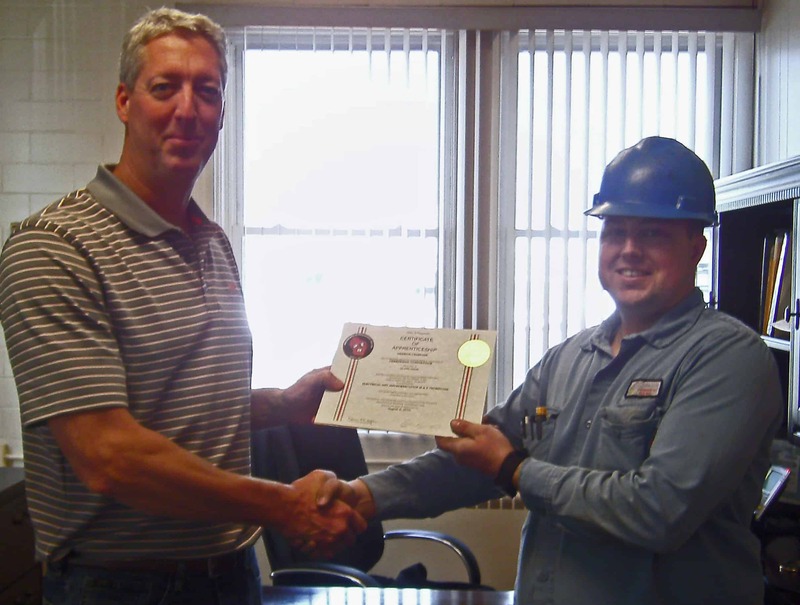 Derrick Cearfoss of ChemDesign has recently completed 10,400 hours of training through Northeast Wisconsin Technical College and has met the requirements under the State of Wisconsin’s Apprenticeship System as a Journeyman Electrical and Instrumentation Technician (E&I Tech). Derrick, pictured with president David Mielke, joined ChemDesign five years ago after receiving a Bachelor’s of Science degree in Computer Science from Northern Michigan University. Since 2009, he has been an Instrument Technician with our maintenance team. A life-long learner who seeks opportunities for career development, he enrolled in the E&I Tech program and attended classes while working fulltime in his field of study. Derrick plans to use his new training to bring additional safety and electrical design expertise to ChemDesign. He is already seeking new career development opportunities in other disciplines of maintenance engineering. At ChemDesign, we are committed to education of all our employees and are proud to sponsor Derrick on his journey. For more information on careers at ChemDesign, please visit our careers page of our website. This entry was posted in Blog and tagged E&I Tech, Journeyman Electrical and Instrumentation Technician, Northern Michigan University, State of Wisconsin Apprentice Program. Bookmark the permalink.